Akira. Ghost in the Shell. Vampire Hunter D. Battle Angel Alita. If you grew up with ’90s anime, this is the stuff you cut your teeth on. As a scrappy teen, I rented everything my local Blockbuster had to offer and watched on repeat, awed by it all. Anime was just beginning to make its way to the states back in those days, but today it’s everywhere from Netflix to Hulu. Some of the ’90s anime classics aren’t so easy to find in DVD form, however (although their sequels and spin-offs are a little easier to get your hands on). If you have an itch to rewatch it all, here is our list of must-watch titles. Released on Christmas day in 1989, Akira is adapted from the best-selling manga of the same name. The story depicts a dystopian city called Neo-Tokyo that’s barely surviving after a thermonuclear attack. In the meantime, a frightening story unfolds involving powerful scientific experiments that can turn humans into something horrifyingly powerful. Akira was easily the film that bridged the gap between Japanese anime and America, and thanks to its influence the medium is more popular than ever today. Not only can you stream Akira with a Hulu account, but you’ll also get access to the streaming service’s gigantic anime selection–not to mention a bevy of movies and TV shows for as little as $7.99 a month. Those waiting on James Cameron’s upcoming action film, Alita: Battle Angel, may not be aware it’s based on a ’90s manga series that was adapted to anime. While Cameron’s adaption seems to be somewhat faithful to the original, there are some parts that you just can’t get unless you watch the source material. A two-part OVA (original video animation) was released in 1993 and is well worth the watch–and then you’ll know just how much backstory got cut when the feature film comes out. It’s free to watch on YouTube. Cowboy Bebop premiered in April 1998 in Japan and was critically acclaimed right out of the gate, fast becoming a ’90s anime classic. Set in 2071 (and yes, ’90s anime LOVED sci-fi settings), a gang of bounty hunters called Cowboys set out to track down criminals in their spaceship Bebop. Former hitman Spike Spiegel and his cohorts are easily some of the most beloved characters in anime. Whether you just want to relive all of its classic moments or are watching it for the first time, Cowboy Bebop is a true gem. Cowboy Bebop is well-worth owning, but if prefer your media digital, Hulu’s got it to stream right now. You can enjoy a 7-day free trial of the service, and subscriptions are less than $8. Neon Genesis Evangelion was unlike any show that came before it (although the concept of giant robots was not new to Japan). Released in October 1995, Evangelion tells the tale of good battling evil in the post-apocalyptic city of Tokyo-3. Protagonist Shinji Ikari’s father recruits him to pilot an Evangelion, a giant mech used in combat again an alien invader called Angels. Evangelion took major risks by weaving concepts from several religions into its plot, and interpretations are still discussed today. While the original series is still around to stream, we recommend the movies, which condense the story into a small package and make for better watching. The rights to Evangelion have just changed hands from Funimation to Netflix, so it’s actually not ready to stream yet…but it will be very soon. In the meantime, you can order this ’90s anime classic in film trilogy form if you just don’t want to wait until April. ’90s anime was a lot darker than the majority of what’s out there today, and Vampire Hunter D is no exception. Although it was originally released in 1985, this gem still stands the test of time. Based on a series of novels by Japanese author Hideyuki Kikuchi, Vampire Hunter D tells the story of a young woman’s fight to live after being bitten by a vampire and the mysterious vampire hunter known as D that fights to save her life. And if you feel like you can’t get enough of this series, good news: there are 19 more novels, and they’ve all been translated into English. It is also free to watch on YouTube (although the English dub is not the greatest). If the only version of Ghost in the Shell you’ve seen stars Charlotte Johansson, we can’t recommend the original ’90s anime enough. Based on a popular manga series, Ghost in the Shell tells the tale of a female cyborg’s hunt for a dangerous hacker known as the Puppet Master. With strong cyberpunk themes and gorgeous music by Kenji Kawai, it was a standout feature from the very beginning. Audiences didn’t agree, though–the film did not perform well in Japanese theaters but found its following after it was released on video. Today, the series has dozens of spinoffs and a dedicated cult following. Ghost in the Shell is on Hulu too, and if you’ve started to notice that Hulu has a lot of classic anime to stream, you’ll see why a lot of fans of it favor Hulu over other streaming options. As aforementioned, you can try it free for a week and monthly subscriptions start at $7.99. Adapted from the classic manga by Rumiko Takahashi, Ranma 1/2 nails the comedy genre perfectly by giving protagonist Ranma Saotome a major problem: turning into a girl anytime he gets splashed with cold water. Problematic, right? The characters in this series are so likable that it’s instantly addictive. Also, if you’d like to see where comedy anime originated, Ranma 1/2 is one of the shows that defined it. 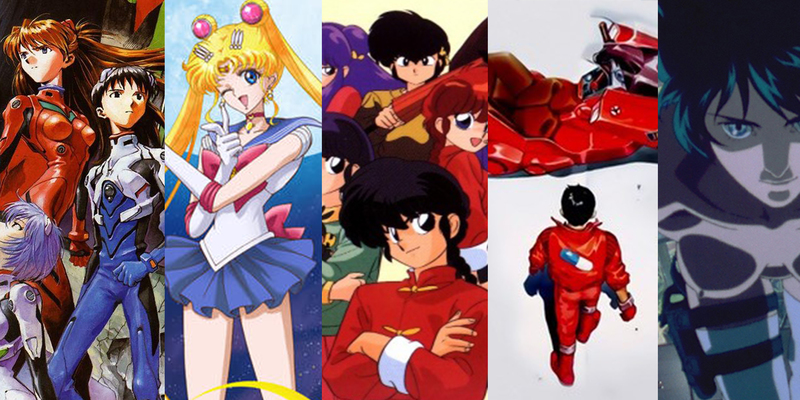 The original ’90s anime series is available to stream on Hulu as well. If you’re a fan of comedies, you should go back and rewatch Ouran High School Host Club too. Do I really need to explain the plot of Sailor Moon? Probably not, but I will just in case you’ve never seen anime in your life, dear reader. Take a teenage girl and her three friends, toss in a splash of magical girl power, and throw in a dashing man who could be friend or foe. Oh, and there’s a talking cat. Who wouldn’t be interested, even if ’90s anime wasn’t something you grew up on? And yes, once again, Hulu’s got the entire series. Did we mention you get a week for free?